British Rail Class 155 "Super-Sprinter"
The British Rail Class 155 "Super-Sprinter" is a diesel multiple unit. 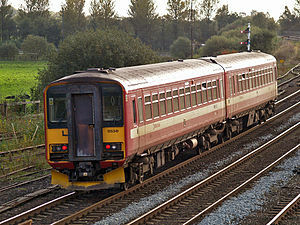 These DMUs were built by British Leyland at Workington (using Leyland National bus components) between 1987 and 1988 as part of British Rail's replacement of its ageing diesel fleet which were First-Generation. This page was last changed on 8 May 2017, at 08:56.